by Bhargavi Zaveri and Pratik Datta. The World Bank's Doing Business report downgraded India's ranking from 140 in 2014 to 142 in 2015. This has not disheartened the government, which continues its campaign aimed at attracting interest in India as an investment and business friendly destination. The campaign has started rubbing off to other arms of government. Even RBI. Recently, the Reserve Bank, in a show of investor friendliness, has reportedly shown an inclination to exempt the Japanese investor, Docomo, from the onerous pricing guidelines applicable to foreign investors exiting India. This exemption, if granted, would have legal consequences for India under the bilateral investment treaties that it has signed with several nations. From a broader perspective, such special exemptions reflect a persistent bias in the Indian executive in favour of the rule of men rather than the rule of law. This usurps discretionary power in the hands of the executive, and increases unpredictability for the economy. This would, ultimately, hurt business. These patchwork responses sap the energy from the deeper institutional transformation that India desperately requires. We do not need one investment from Docomo, as much as we require for RBI to solve the mistakes of its pricing guidelines. Enforcing the rule of law is more important than doing justice. RBI has conventionally frowned upon foreign investors having an assured return on equity investments made by them in Indian companies. Typically, a foreign investor is allowed to cash-out his investment through a public listing of the investee company, or failing a public listing, through a put option. A put option allows the investor to put his shares on the Indian JV or the Indian JV partner at a pre-determined price. Until 2013, RBI strongly objected to this exit mechanism. In January 2013, it finally allowed foreign investors to exit by putting his shares on the Indian JV partner or the Indian JV itself. One of the conditions for allowing this exit was that the price to be paid by the Indian JV partner to the outgoing foreign investor could not exceed the market price of the foreign investor's stake, at the time of exit. The foreign investor could not exit at a pre-determined price, the principle being that foreign investors could neither ask for nor get an assured return, for investing in the equity of an Indian company. India's relationship with Japan in relation to FDI flows. MFN stands for Most Favoured Nation. Bilateral investment treaties that India has entered into with other nations usually contain MFN clauses. When an investment treaty between India and Country A has an MFN clause, India cannot treat investments from Country A less favourably than investments from any other country. In recent past, an Australian investor invoked the MFN clause in the 1991 Australia-India bilateral investment treaty and successfully sued the Indian government. RBI proposes to exempt the Docomo exit from the legal restriction on put option pricing. Reportedly, one primary reason for this exemption is the investment relationship with Japan - India happens to be the top investment destination for Japanese firms. RBI (being an extension of the Indian state), in its executive capacity, decided to exempt Docomo because it is a Japanese firm. If this exemption is, in fact, granted, it opens the floodgates for investors seeking similar exemptions, from RBI and the government in future. The refusal to grant such exemptions would amount to treating these investors less favourably than an investor from Japan. This would violate MFN clauses in bilateral investment treaties that India has entered into with the countries of such investors. For an analogy, see this case where India was caught in the wrong in 2011. The rule of law is a subtle and complex concept. All too often, the individuals who man government fall into the trap of doing justice instead of practicing the rule of law. But these are different in important ways. The RBI `regulation' imposing pricing conditions for exit of foreign investors does not specifically allow exemptions from the requirement that the price must be not less than the floor specified in the policy. Even assuming that a regulator has an inherent power to make exemptions from its own policy, nobody knows the considerations for judging an application for such exemption. Particularly, in the capital controls regime, the government and RBI have repeatedly succumbed to the temptation of deviating from its own policy, on a case-by-case basis. We may point out that while the Indian State repeatedly fails on problems of the rule of law, the lapses are particularly glaring in the field of capital controls. For instance, take the case of allowing FDI in the brownfield pharmaceuticals sector. In 2014, the government prohibited foreign investors from imposing non-compete restrictions on their Indian JV partners, in the brownfield pharmaceuticals sector. However, it retained the power to allow such restrictions in "special circumstances". What these special circumstances are, remains unclear. Neither the law nor the policy gives any guidance to JV partners as to what they should do to satisfy the government that theirs is a "special" case. While it is the government's prerogative to retain discretion, basic governance principles require that the law and the policy clearly specify the conditions on which executive discretion will be used. If the government is serious about elevating India's status as a business and investor friendly nation, policymakers must look beyond seemingly well-timed special cases and exemptions. Such short-termism increases policy risk. It sends out the wrong signals that the investment framework in India is susceptible to extralegal considerations. The need of the hour is to take a deeper look at the way policy frameworks are framed and administered, to see whether they infuse certainty in policy administration. A robust rule of law system, instead of arbitrary exemptions, is the only way of improving investor confidence in India. This is not an isolated example; it falls within a larger context of difficulties at RBI on thinking about the rule of law and public administration [example 1, example 2, example 3, example 4, example 5]. There is an urgent need for improvements in intellectual capability at RBI on these issues, which are the foundation of sound governance. The IFC would put the ship on the right course. The Macro/Finance Group at NIPFP is recruiting. In March 2011, the Government of India setup the Financial Sector Legislative Reforms Commission to review, rewrite and harmonise financial sector legislations, rules and regulations. In its recommendations, the FSLRC proposed that the draft Indian Financial Code, an umbrella legislation, replace the bulk of existing financial laws and improve the ease of doing business in India. One of the key provisions of the IFC is setting up of various regulatory agencies. In order to build these regulatory agencies, the Ministry of Finance, Government of India announced a group of Task Forces. These Task Forces are implementation teams which will design and build these institutions. Macro/Finance Group at NIPFP is the `secretariat' doing implementation for the Task Forces. The positions available are in project management, data analysis, procurement of services, and oversight of external contractors towards building these agencies. Design and implement the project plan through which the steady-state agency will be achieved. This includes procuring consulting/IT firms for implementing the plan, and then exercising oversight over them. Participate in other related projects on the implementation of the FSLRC report. Graduate or Undergraduate degree from a reputed university with a major in any of the following disciplines - Management, Engineering, or Commerce. Candidates with 3-5 years of experience in the areas of work stated above are preferred. Personnel will be appointed on a contractual basis as per applicable rules and norms followed by NIPFP. IGIDR Finance Research Group is engaged in analytical and policy-oriented research in finance. See the papers, the fifth of an annual conference series, and systems. IGIDR FRG has the best data centre for doing high frequency finance with Indian data; this involves big data and computational finance. IGIDR FRG supports the Standing Council on International Competitiveness of the Indian Financial System, and is part of the `Bankruptcy Legislative Reforms Commission' (BLRC), chaired by T. K. Viswanathan. These are policy projects of the Ministry of Finance. If you are interested in working in analytical, computational or policy-oriented finance, please contact Jyoti Manke <jyotimanke@gmail.com> by 15 January. The primary objective of a financial system is to efficiently allocate capital. The key step in allocating capital efficiently is to assess and price risk correctly. Correct pricing of risk ensures that it is properly distributed - capital providers get to hold assets that reflect their risk appetite and present them with an efficient risk-reward trade off. Banks are an important vehicle for linking up the savings and investment of India. It is critical that banks price risk correctly. 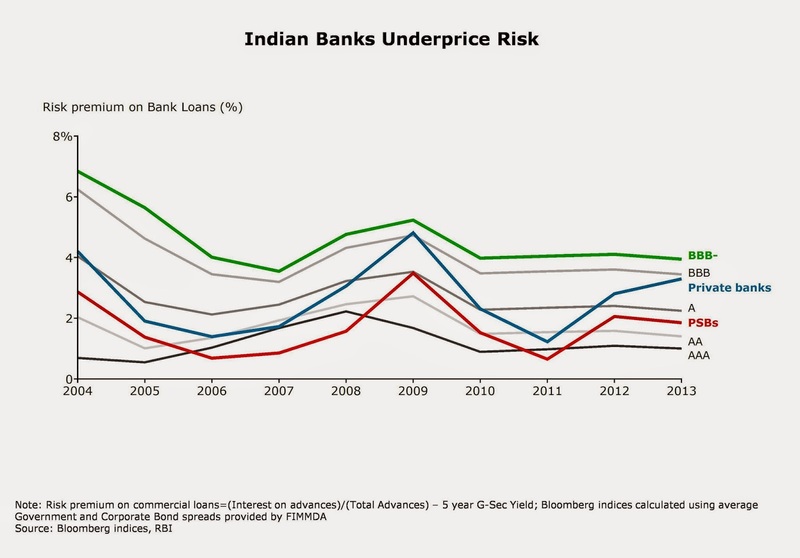 There are concerns about how Indian banks are pricing risk. The chart below shows the average risk premium charged by the banking system on commercial loans in comparison with the risk spreads on various ratings of bonds. This shows that private sector banks priced their loan book as if it was rated between AA and A whereas public sector banks priced loans as if they were rated between AAA and A. The risk spreads spiked in FY 2009, the year of global financial crisis. The financial years 2006 to 2008 appear to be `carefree' lending years: there was the biggest ever boom in bank credit, and risk premia were the lowest. The first criticism is valid - the bond market is indeed very shallow, and that hampers our ability to read information from it. However, there are two key data points that will throw some more light on this issue. Firstly, in the chart below we show the rating distribution of the top 3 rating agencies in India for the financial year 2009 and 2013. These three agencies account for over 95% of all bonds rated in India. 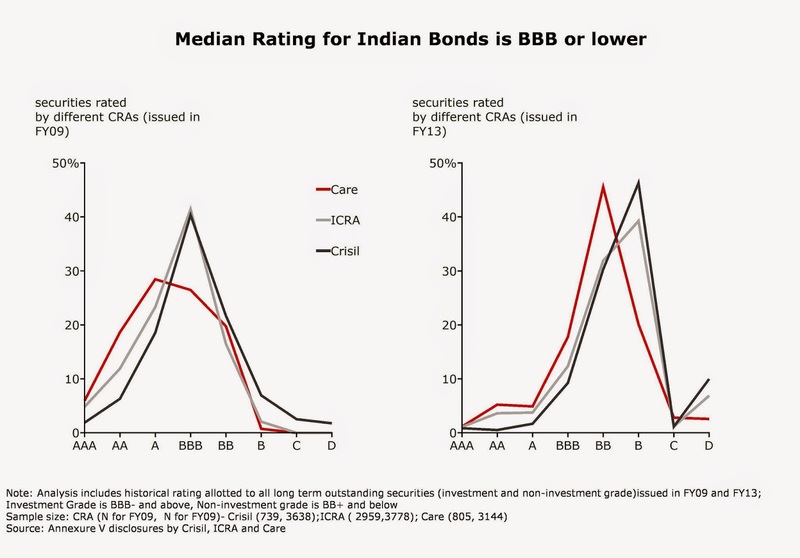 The data shows that the median and mean rating of the bonds was BBB in both the years. The overall rating profile deteriorated over these 4 years. Also, the companies that issue rated bonds are typically larger in size and more established. The firms that banks lend to are, to a greater extent, Small and Medium Enterprises (SME) which are riskier than the large companies that access the bond market. Thus, it is fair to expect that the average rating of the portfolio of banks should be worse than the average bond rating. Is this an issue of underestimating the risk, or bad pricing? Unfortunately the analysis does not throw much light on the cause of mispricing. But here is another piece of data that may be insightful. In FY 2012, the Indian banking system had ~ 76 Mn commercial loan accounts (i.e. loan accounts for commercial loans excluding Individual loans). Of these about 72,000 were loan accounts of value above 5 crore, and this subset accounted for 80% of the loans of banks. Currently, around 40% of these accounts are rated by rating agencies. (Under Basel II, banks are allowed to use external rating for their loans). This means that about a 3rd of the loan book by value of the banking system is rated by the same rating agencies that rate bonds. It's unlikely that the ratings agencies use radically different (and lower) standards for rating bank loans. This implies that the cause of underpricing may not be misunderstanding risk but mispricing it. The second criticism, of loan covenants assigning better rights to the lender (i.e. banks) than bond covenants is plausible. It is hard to test empirically unless we get the data on recovery rates of loans vs. bonds. I feel that while this is a factor at work, it cannot explain the significant difference between the loan spreads and bond spreads. Finally, the criticism about retail loans in the portfolio. It is true that the retail secured lending (eg housing, car loans) has demonstrated a much better risk profile over the last decade or so. However, it is important to note that retail lending constituted about 22% of the overall loan book of Indian banks, and hence the lower risk on retail is unlikely to significantly lower the overall risk. I hope to have persuaded you that there is evidence in favour of systematic mispricing. This takes us to the next question: Why would there be such systematic mispricing? There are two possible reasons. First, excessive competition, especially in the larger and relatively better rated lending, that drives pricing down. The other reason is more nuanced. Historically, a significant part of the banks' deposits base (~ 33%) was under interest rate regulation - these are the "CASA" (Current Accounts, Savings Account) resources that all banks chase. The chart below presents some interesting analysis. 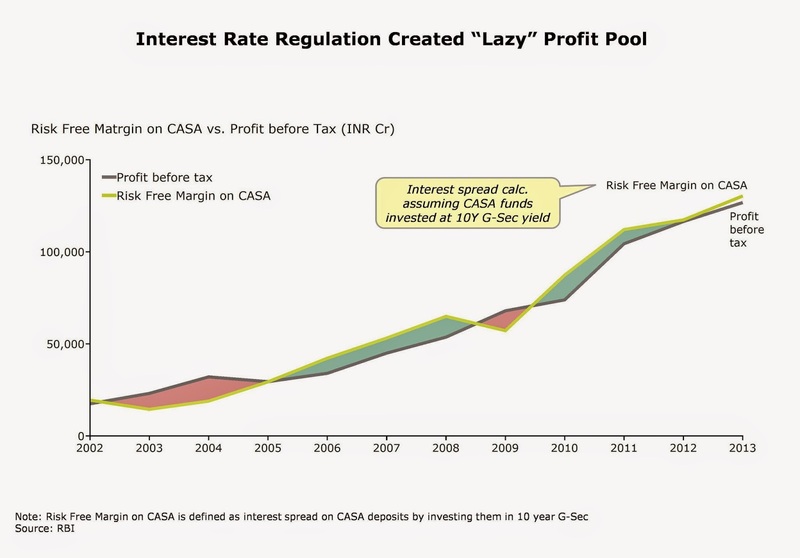 Consider this: if the banking system as whole did nothing but took CASA deposits and invested in the risk free 10 year government security (we call this Risk Free Margin on CASA) then the margin it would make is more or less the same as the pre-tax profits of the banking system! Over the last decade, the risk free margin on CASA was more than the pretax profits of the system except in a few years when the yields on government securities had fallen precipitously - FY 03, FY04 and FY09. This "lazy profit" has been created by regulations. It is this profit pool that allows banks to underprice loans, effectively creating a system wide wealth transfer from (CASA) depositors to commercial borrowers. Most banks use a cost plus approach to loan pricing where the loans are priced at a margin over the cost of funds, which are kept low by interest rate regulation. Despite lifting the SA interest regulation a couple of years ago, only 3 relatively small banks have changed their SA pricing. Using sources of funds whose cost has been kept low, because of regulations, to underprice risk in lending, effectively engineers a large scale wealth transfer from depositors to borrowers. This wealth transfer can be interpreted as being an integral part of the system of financial repression which is in operation in India. Systematically mispriced risk will result in misallocated capital. Is this one of the reasons that the system regularly runs into NPA crises? Is this systematic transfer of wealth the reason why households avoid bank deposits and prefer to hold other kinds of assets? As the Indian economy grows, our financial system should not just grow in size, but also evolve to become more sophisticated and allocate capital more efficiently. With a monolithic system dominated by public sector banks, we have not seen such evolution. Banks today look and behave the same way they did 10 years ago, they are only a lot bigger. Fundamental change in the framework for financial economic policy will give a banking system that allocates resources better, and is safer.